The “unbreakable alliance,” which will be confirmed by the upcoming visit of President Barak Obama to Israel , will disqualify the United States as an honest broker of peace in the Arab – Israeli conflict in Palestine , a Palestinian veteran peace negotiator says. This “unbreakable alliance” will doom whatever hopes remain during Obama’s visit for the revival of the U.S. – sponsored deadlocked “peace process,” on the resumption of which depends the very survival of Palestinian President Mahmoud Abbas’ leadership, and explains as well the Palestinian frustration, low expectations, unenthusiastic welcome and the absence of celebrations for their most cherished among world celebrities, in a stark contrast to the euphoria that is sweeping Israel in waiting for what the U.S. and Israeli officials are describing as an “historic” visit. On February 19, the Israeli Prime Minister’s Office released the official blue, red and white logo that will be on all documents and signs during Obama’s visit late in March. The logo shows the words “Unbreakable Alliance” written in English and Hebrew under a combined Israeli and U.S. flags. During his visit, Obama will become the first ever serving U.S. president to receive Israel’s presidential medal to honor the fact that he has “established the closest working military and intelligence relationship with Israel in the country’s history: Joint exercises and training, increased security assistance every year, unprecedented advanced technology transfers, doubling of funding for Israel’s missile defense system, and assistance in funding for the Iron Dome system,” according to Steven L. Spiegel in Huffington Post late last year. Therefore, “there are no plans to celebrate” Obama’s visit to Ramallah, because “they haven’t forgotten the part he played” in aborting the PLO’s efforts in 2011 to win the United Nations’ recognition of Palestine statehood as a full member and in opposing its UN recognition as a non – member observer state the next year, according to Shlomi Eldar in Al-Monitor on February 14. Still, to make a bad situation worse, Obama will convey the same message to Abbas during his upcoming visit, because “our position has not changed” neither to Palestinian statehood nor to Palestinian national reconciliation according to U.S. State Department spokeswoman Olivia Nuland on February 19. Obama will visit on the backdrop of a two –year old simmering Palestinian – U.S. political crisis, which potentially could explode in the aftermath of his visit. The U.S. subscription to the UN recognition of Palestinian statehood would establish irrevocably the prerequisite to make or break the only viable “two – state solution” for the almost century – old conflict, because it would confirm the 1967 borders as the basis for such a solution and, consequently, will for sure defuse the time bomb of the Israeli illegal settlement enterprise in the Palestinian occupied territories and pave the way for the resumption of negotiations. However neither Obama nor the U.S. is forthcoming and they continue to “manage” the conflict instead of seriously seeking to solve it. Emmerson, the United Nations’ special rapporteur for human rights and counterterrorism, will spend the next five months doing something the Obama administration has thoroughly resisted: unearthing the dirty secrets of a global counterterrorism campaign that largely relies on rapidly proliferating drone technology. Announced on Thursday in London, it’s the first international inquiry into the drone program, and one that carries the imprimatur of the world body. 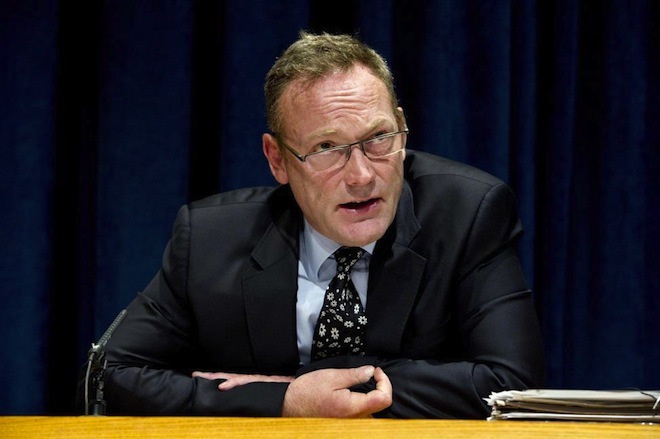 By the next session of the United Nations in the fall, Emmerson hopes to provide the General Assembly with an report on 25 drone strikes in Afghanistan, Pakistan, Yemen, Somalia and Palestine where civilian deaths are credibly alleged. That carries the possibility of a reckoning with the human damage left by drones, the first such witnessing by the international community. Accountability, Emmerson tells Danger Room in a Monday phone interview, “is the central purpose of the report.” He’s not shying away from the possibility of digging up evidence of “war crimes,” should the facts point in that direction. But despite the Obama administration’s secrecy about the drone strikes to date, he’s optimistic that the world’s foremost users of lethal drone tech will cooperate with him. In conversation, Emmerson, who’s served as special rapporteur since 2011, doesn’t sound like a drone opponent or a drone skeptic. He sounds more like a drone realist. “Let’s face it, they’re here to stay,” he says, shortly after pausing to charge his cellphone during a trip to New York to prep for his inquiry. “This technology, as I say, is a reality. It is cheap, both in economic terms and in the risk to the lives of the service personnel who are from the sending state. Emmerson has zeroed in on the most heated debate about the drones, a subject around which there is little consensus and fewer facts, thanks to government secrecy. 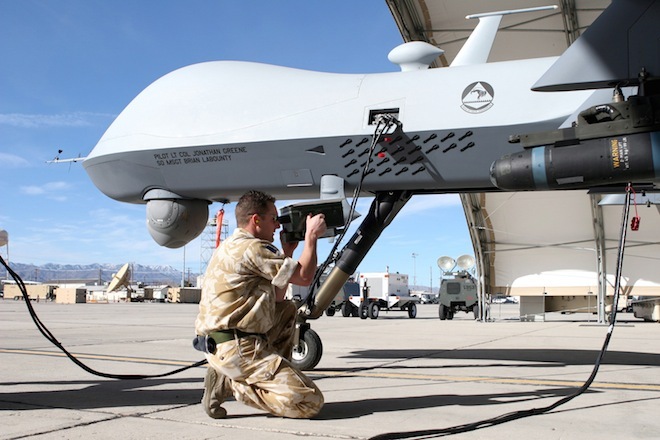 Do the drones kill fewer people than other methods of warfare? Or does their seeming ease of use make warfare easier to proliferate, and therefore kill more people — terrorist and innocent — than they otherwise would? There are several independent studies, mostly relying on uncertain local media reports from the dangerous places the drones overfly, and no agreement. As the sabre rattling against Syria gets ever louder, the allegations ever wilder and double standards, stirring, plotting and terrorist financing (sorry: “aiding the legitimate opposition”) neon lit, it is instructive to look at the justifications presented by US Administrations for a few other murderous incursions in recent history. This month is the twenty third anniversary of the US invasion of Panama on 20th December 1989, as Panamanians prepared their Christmas celebrations. A quick check reminds the late Philip Agee recalling President George H.W. 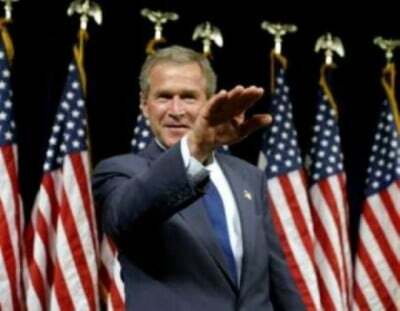 Bush telling the American people that the threat from Panama (pop: 3,571,185 – 2011) was such that: “our way of life is at stake.” Agee referred to this in his aptly named talk “Producing the Proper Crisis.”(i) Apt then as now. Nothing changes. 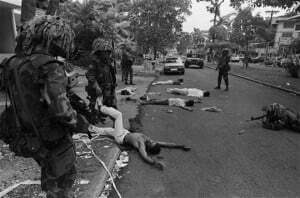 The aim of the invasion was to capture the country’s leader General Manuel Noriega and, of course, to: “establish a democratic government.” Regime change. With the approaching transfer of control of the Panama Canal to Panama (originally scheduled for 1st January 1990) after a century of US colonial stewardship, America wanted to ensure it was in the hands of malleable allies. Noriega a CIA asset, since 1967 (ii) who had also attended the notorious School of the Americas, at Fort Benning, Georgia, came to power with US backing, but seemingly his support for the US was cooling. To encapsulate a long story, the US kidnapped him and sentenced him to forty years in jail. All military marauding should simply be called: “Operation Silly Name 1, then 2,3,4” etc., until the numbers finally run out. Twenty seven thousand US troops backed by Apache helicopters decimated much of the small country, with a defence force of just three thousand. George Bush Snr., said he was removing an evil dictator who was brutalizing his own people (sound familiar?) and that the action was needed to:” protect American lives.” It was also to: “defend democracy and human rights in Panama” – and to “protect the Canal.” Surprise, eh? 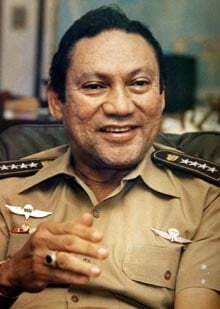 Manuel Noriega was released from US jail in 2007, extradited to France which had awarded him the country’s highest honour, The Legion d’honneur in 1987. He remained in jail in France until December 2011, when he was returned to Panama, where he is still imprisoned. “Everything that moved they shot”, said a city resident. There was worse. As the current self righteous, if contradictory statements flow from Washington and Whitehall about Syria’s unproven chemical weapons, proven facts relate to America’s. Many analysts felt that Panama was the testing ground for Iraq. Highly toxic and radioactive substances were introduced into Iraq however, in the form of up to seven hundred and fifty tonnes of chemically toxic and radioactive depleted uranium munitions (DU) which have a toxic “half life” of 4.5 billion years. Iraq’s litany of deformed, still born, aborted babies, infants born with cancers, the tiny graves, silent testimony to weapons of mass destruction of unique wickedness. Iraq was bombed for forty two days and nights. The hyped chemical weapons alleged to have been manufactured by Iraq were, of course, never deployed. On 24th March 1999, NATO began to liberate Kosovo from Serbia. (US Silly Name: Operation Noble Anvil) Kosovo had an estimated ten trillion dollars worth of “inexhaustible” minerals in the Trebca mines. The “liberation” was seventy eight days of relentless bombardment, including use of depleted uranium weaponry. Twenty thousand tonnes of bombs were dispatched. Destroyed systematically were communications centres, fuel depots, airports, traffic communications, trains, markets, the Chinese Embassy – China was against the attack, NATO, resoundingly unconvincingly, said they had the wrong map. And of course, the media centre. Murdering journalists is now another routine, unaccountable war crime. The industrial scale destruction, however, left the Trebca mines unscathed. On 14th August 2000, nine hundred heavily armed British, French, Italian, Pakistani and KFOR troops were landed from helicopters at the mines. Managers and workers tried to fight them off and were beaten, tear gassed with plastic bullets used. The resisting staff were arrested. 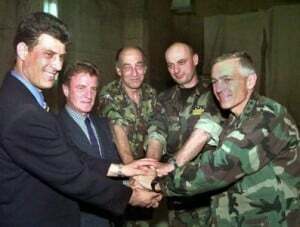 The “Kosovo Liberation Army” had been: “ … trained for years and supported with millions of US dollars and German Marks … through the CIA and BND” (German Intelligence) “for this war, misleadingly called a civil war”(vi) by NATO governments and spokespersons. DU’s chemical and radiological properties were rained down throughout former Yugoslavia too. By 2001, doctors in the Serb run hospital in Kosovo Mitrovica stated that the number of patients suffering from malignant diseases had increased by two hundred percent since a 1998 survey. The peacekeepers, of course were there for just weeks or months, the people of the region live there, the plight of their health and that of future generations ignored and forgotten by their “liberators.” They had other “tyrants” to topple, other populations to relieve of their lives and limbs and livelihoods. “2nd September 2002: Experts: Iraq has tons of chemical weapons. “As some in the Bush administration press the case for a pre-emptive strike against Iraq, weapons experts say there is mounting evidence that Iraqi President Saddam Hussein has amassed large stocks of chemical and biological weapons he is hiding from a possible U.S. military attack. With Biden now Vice President, it is impossible not to wonder whether he has any input in to the Syria spin, with its uncannily similar words. Further: “U.N. weapons experts have said Iraq may have stockpiled more than 600 metric tons of chemical agents, including mustard gas, VX and sarin. Some 25,000 rockets and 15,000 artillery shells with chemical agents are also unaccounted for, the experts said. “The concern is they either have on hand — or could quickly re-create the capability to produce — vast amounts of anthrax, tons of material”, was Wolfsthal’s additional spin. 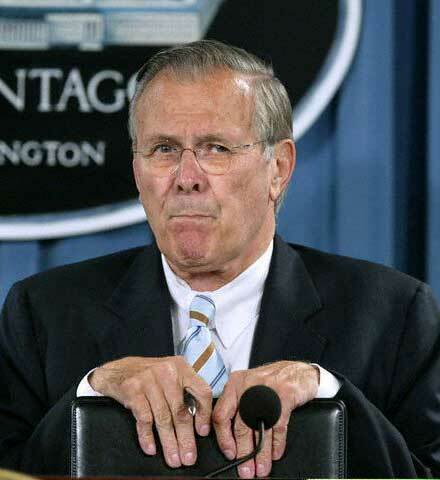 “Defense Secretary Donald Rumsfeld” asserted :“… Iraq has mobile biological weapons laboratories, which would be nearly impossible for U.S. forces to target.” The lives of thousands of people were at stake, he said. Indeed, since the invasion, Iraqi deaths at American and British hands or that of their militias, and imposed puppet government, are nothing short of holocaustal. According to Jonathan Schwartz, who revisited General Colin Powell’s pack of lies on Iraq to the UN on 5th February 2003 : “ My colleagues, every statement I make today is backed up by sources, solid sources. These are not assertions. What we’re giving you are facts and conclusions based on solid intelligence …” Powell is now regretful. The entirely illegal invasion of Iraq, based on a trans-Atlantic pack of lies had commenced just forty five days later. Operation Very Silly Name? “Operation Iraqi Liberation”: OIL. After Tony Blair’s embrace of Colonel Gaddafi in March 2004, the British government announced plans to send their experts to Libya to destroy the chemical weapons they had sold, stating that Colonel Gaddafi had mislead Blair over their existence. That they had the remittance documents seems to have escaped them. Identical to UK duplicities over Iraq. Between the start of Libya’s destruction on 19th March 2011 and NATO taking over on 31st March 2011, the US and UK dropped one hundred and ten Cruise missiles on a country with a population of under six and a half million. When NATO assumed command of the “humanitarian intervention” they assaulted this minimal population with 26,500 bomb- releasing sorties. There were, of course no Presidential tears for Libya’s lost children, whose demise would have been preceded by unimaginable terror, in an onslaught which had two Silly Names, one for the US: “Operation Odyssey Dawn” and one for NATO: “Operation Unified Protector”, the latter, comment defying. Quadaffi himself lost three small grandchildren and three sons. In 1986 in another US bombing, he lost a just toddling adopted daughter. What an age since she said: “I really believe that it takes a village to raise a child.” Now her beliefs are apparently to wipe out the village, its children, parents and lynch the village elder for a tele-opportunity of raucous mirth. “We have made our views very clear.This is a red line for the United States. I’m not going to telegraph in any specifics what we would do in the event of credible evidence that the Assad regime has resorted to using chemical weapons against his own people, but suffice to say we are certainly planning to take action if that eventuality were to occur,” she said at a press conference in Prague. “Déjà vu all over again”, as the saying goes. “We fear there is a conspiracy to provide a pretext for any subsequent interventions in Syria by these countries that are increasing pressure on Syria.” Indeed. It would hardly be a first. In late October US troops arrived in Jordan for a major joint exercise near the Syrian border. Operation Silly and Childish Name: “Operation Eager Lion.” Al Assad in arabic translates as: the lion. Ironically the first allegation of Syria having chemical weapons would seem to have come from John R.Bolton, alleged by Congressman Henry Waxman to have persuaded George W. Bush to include the fairy story of Iraq purchasing yellow cake uranium from Niger in his 2003 State of the Union address.The allegation is unproven, however, since the documents are still classified. Bolton is involved with a plethora of less than liberal organizations, including the Project for the New American Century, The Jewish Institute for National Security Affairs (JINSA) and the currently in the news, The National Rifle Association. Relating to Syria, it should also be remembered that the country has been under increasingly strangulating sanctions since 2004. Former Chief Weapons Inspector in Iraq, Scott Ritter has written that: “chemical weapons have a shelf life of five years. Biological weapons have a shelf life of three.” They also give off an “ether”, say experts, which can be picked up by satellite surveillance, which Syria, as Iraq before it is certain to be comprehensively subject of. Heaven forbid Washington, Whitehall, Tel Aviv and the coalition of the coerced are crying “Wolf!” again. Heaven help anyone who believes them. The Western media suggests –in chorus and without evidence– that a “frustrated” and “desperate” president Bashar al Assad is planning to use deadly chemical weapons against his own people. Last week, U.S. officials revealed to NBC News that “Syria’s military has loaded nerve-gas chemicals into bombs and are awaiting final orders from al-Assad”. Western governments are now accusing Syria of planning a diabolical scheme on the orders of the Syrian head of State. Meanwhile, the media hype has gone into full gear. Fake reports on Syria’s WMD are funneled into the news chain, reminiscent of the months leading up to the March 2003 invasion of Iraq. The evolving media consensus is that “the regime of Syrian leader Bashar al-Assad appears to be entering its twilight” and that the “international community” has a responsibility to come to the rescue of the Syrian people to prevent the occurrence of a humanitarian disaster. The antiwar critics have largely underscored the similarities with the Iraq WMD ploy, which consisted in accusing the government of Saddam Hussein of possessing Weapons of Mass Destruction (WMD). The Syria WMD saga is in marked contrast to that of Iraq. The objective is not to” justify” an all out humanitarian war on Syria, using chemical weapons as a pretext. An examination of allied military planning as well as the nature of US-NATO support to the opposition forces suggests a different course of action to that adopted in relation to Iraq (2003) and Libya (2011). The purpose is indeed to demonize Bashar Al Assad but the objective at this stage is not the conduct of an all out “shock and awe” war on Syria, involving a full fledged air campaign. Such an action would, under present conditions, be a highly risky undertaking. 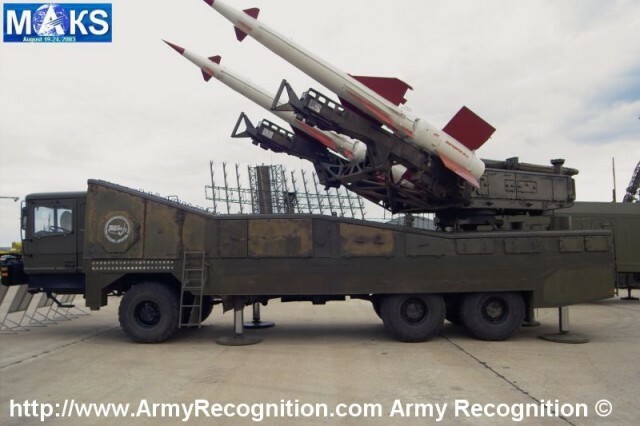 Syria has advanced air defense capabilities, equipped with Russian Iskander missiles (see image) as well as significant ground forces. A Western military operation could also lead to a response from Russia, which has a naval base at the port city of Tartus in Southern Syria. 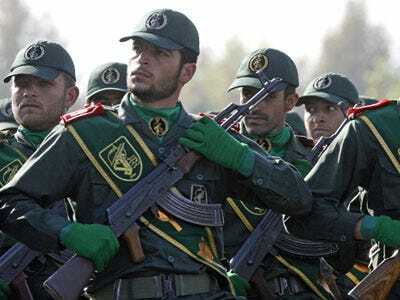 Moreover, Iranian forces from its revolutionary guards corps (IRGC) are present on the ground in Syria; Russian military advisers are involved in the training of the Syrian military. At this juncture, despite US-NATO military superiority, an all out military operation, for the reasons mentioned above, is not contemplated. Non-conventional warfare remains the chosen avenue. Reports confirm that NATO-led military operations would be largely in support of rebel forces, its command structure, communications systems, recruitment, training, the transfer to rebel forces of more advanced weapons. Part of this undertaking including the training of rebels is being carried by private mercenary companies. 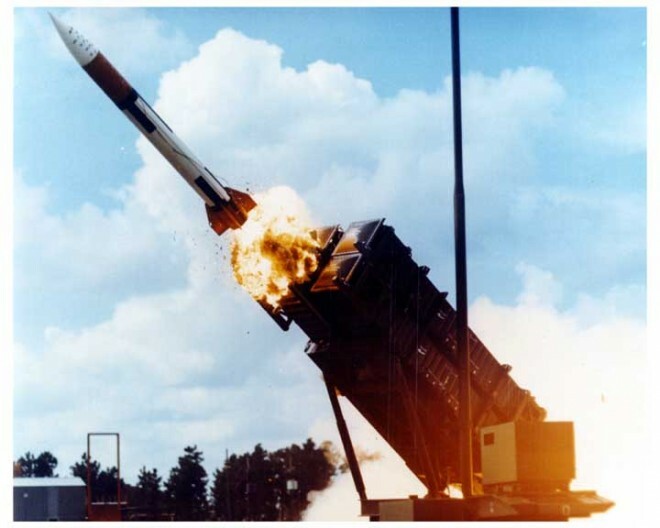 A limited and selective air campaign in support of the rebels, using Syria’s chemical weapons bunker stockpiles as a pretext could be contemplated, but even this would be a risky undertaking given Syria’s air defense capabilities. What was on the drawing board of a recent “Semi-Secret” Meeting in London, hosted by General Sir David Julian Richards, head of Britain’s Defense Staff is a coordinated military agenda characterised by “air and naval support, plus military training for the opposition”. The thrust of this London gathering behind closed doors (reported on December 10, 2012) was to support a unified military command structure of opposition forces designed to “unify insurgent ranks” fighting government forces. In practice, this will require a renewed influx of mercenaries under the supervision of Western special forces which are already on the ground inside Syria. The training component of US-NATO action is of crucial importance. How does it relate to the Syria ‘chemical weapons’ issue? The Western military alliance does not contemplate at this stage an all out war in response to Syria’s possession of chemical weapons. What is contemplated is the need to train the opposition rebels in the handling of chemical weapons. This is not a rebel training exercise in non-proliferation. While president Obama states that “you will be held accountable” if “you” (meaning the Syrian government) use chemical weapons, what is contemplated as part of this covert operation is the possession of chemical weapons by the US-NATO sponsored terrorists, namely “by our” Al Qaeda affiliated operatives, including the Al Nusra Front (see image on right), which constitutes the most effective Western supported and trained fighting group, largely integrated by foreign mercenaries. In a bitter twist, Jabhat al-Nusra, a US sponsored “intelligence asset” was recently put on the State Department’s list of terrorist organizations. The West claims that it is coming to the rescue of the Syrian people, whose lives are allegedly threatened by Bashar Al Assad. The truth of the matter is that the Western military alliance is not only supporting the terrorist, including the Al Nusra Front, it is also making chemical weapons available to its proxy “opposition” rebel forces. The next phase of this diabolical scenario is that the chemical weapons could be used by the “opposition” terrorists against civilians, which could potentially lead an entire nation into a humanitarian disaster. Ironically, at the outset of this diabolical plan, the US special forces incursion and air operation were not to be directed against the Syrian regime. In fact quite the opposite. The stated intent of the operation was to protect civilians against “opposition” rebels, rather than government forces. What the Pentagon was saying in August, was that these WMD could fall in the hands of the “pro-democracy” freedom fighters recruited and financed by several of America’s close allies including Turkey, Qatar, Saudi Arabia, in liaison with Washington and NATO headquarters in Brussels. In essence, Defense Secretary Leon Panetta was refuting his own lies. In August he acknowledged the terrorist threat, now he is accusing Bashar Al Assad. Tacitly acknowledged by Washington, the majority of the Syrian freedom fighters are not only foreign mercenaries, they also belong to extremist Islamist groups, which are on the State Department’s list of terrorist organizations. Israel is a partner in the Syria chemical weapons operation in liaison with NATO and the Pentagon. If the Obama administration were genuinely concerned in preventing these chemical weapons from falling “in the wrong hands” (as suggested by the Pentagon in August), why then are they now training “opposition rebels” –largely composed of Salafist and Al Qaeda affiliated fighters– to gain control over government stockpiles of chemical weapons? The central question is: what is the nature of this gruesome covert operation? Is the purpose of the US-NATO led operation to “prevent” or “encourage” the use of chemical weapons by the Free Syrian Army (FSA)? The above report confirms that the US and NATO are training terrorists in the use of chemical weapons. Does this type of specialized training require the actual handling of toxic chemicals? In other words, is the Western military alliance, through its appointed defense contractors, making chemical weapons available to terrorists for training purposes? I should be noted that the use of chemical weapons by opposition forces does not require that the rebels actually secure control over government stockpiles. Chemical weapons can easily be made available (from Western stockpiles) to the defense contractors involved in the specialized chemical weapons training programs. Needless to say, the chemical weapons training and the involvement of private mercenary outfits on contract to NATO and the Pentagon, increase the risk; they create conditions which favor the use of chemical weapons by opposition forces, thereby potentially triggering a nationwide humanitarian disaster. The US-NATO coalition has clarified at its “semi-secret” meeting in London (reported on December 10), however, that it does not contemplate “boots on the ground”. The special forces will be working with the opposition insurgency against government forces. In the absence of an all out US-NATO military operation, the focus is on non-conventional warfare. In this context, one of the diabolical “options on the table” is to create conditions whereby chemical weapons “fall in the hands” of the terrorists thereby potentially triggering a nationwide humanitarian disaster. While this option would not require US-NATO military intervention, the humanitarian catastrophe would set the stage for the collapse of the Syrian government, namely the long sought objective of “regime change”. The Libya or Iraq model is not an option. The strategic choice of the Western military alliance points towards the possible staging of a humanitarian catastrophe? In the logic of war propaganda and media disinformation, the deaths of civilians resulting from the use of chemical weapons would be blamed on President Bashar Al Assad, with a view to enforcing subsequent actions by the US-NATO military alliance. We are not suggesting that this option will inevitably be carried out. What we are saying is that the option of a staged humanitarian disaster is on the US-NATO drawing board. How can we ensure that this gruesome and diabolical option be thwarted and definitively shelved? The issue must be brought into the open. 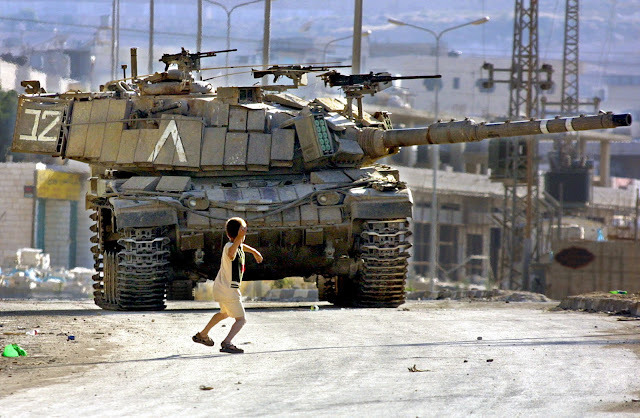 Public opinion must be mobilized against the US-NATO-Israel led war. Denounce the Déjà Vu WMD lies. Challenge the mainstream media consensus. 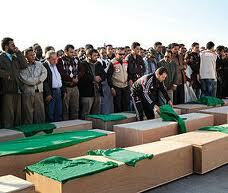 Reveal and refute the lies and fabrications concerning Syria’s chemical weapons program. Bring the issue to the forefront of public debate, Confront the war criminals in high office.